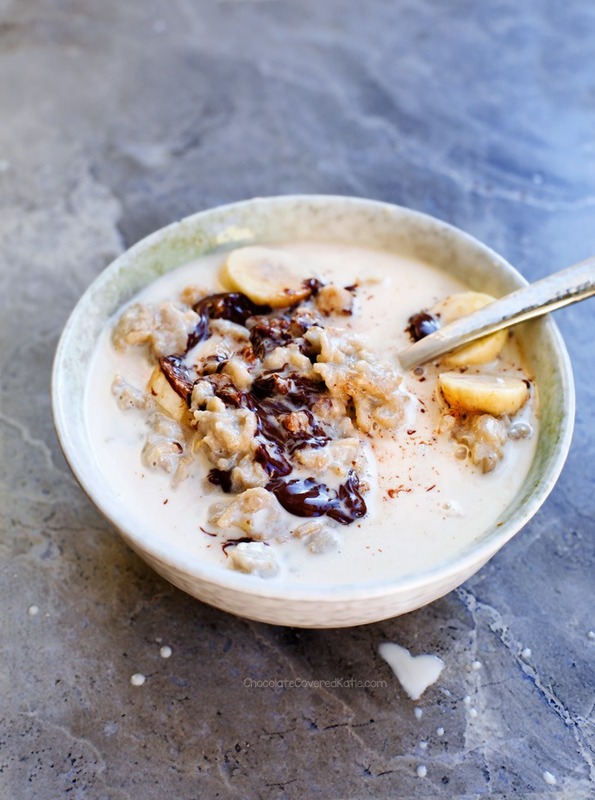 Banana Oatmeal Recipe - A Super Healthy Breakfast! This healthy banana oatmeal recipe is one of the easiest and most delicious breakfasts you will ever make! I get so many comments and emails from people saying they’d love to eat healthier… if only it weren’t so time-consuming or expensive. And truthfully, in contrast to this simple banana oatmeal, such a large number of the healthy recipes out there really do make it seem like you need to splurge on specialty flours, superfood powders, and $10 bottles of green juice if you want to be healthy. But healthy eating doesn’t need to be so complicated, and the goal on my blog has always been to make this lifestyle as simple and do-able for as many people as possible. I try to ensure most of my recipes call for ingredients you can easily find in regular grocery stores, because I know it’s not always feasible or desirable to jet off to Whole Foods every time you just want to make breakfast. This basic banana oatmeal proves it is not only possible, but also completely delicious, to have a healthy breakfast without all the bells and whistles. Any grocery store worth its salt will carry all of the necessary ingredients, and you can even make it ahead the night before if you’re really short on time. ❤ I love how the milk splashed in the shape of a heart. The basic recipe requires just FOUR main ingredients, and you can dress it up however you’d like. 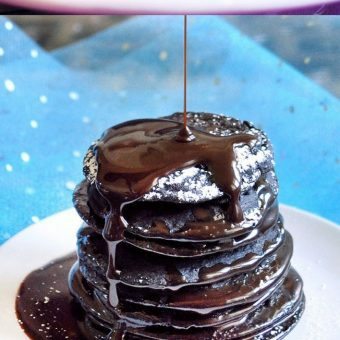 I often will add peanut butter or almond butter, or I’ll throw in some mini chocolate chips at the last minute, so they get all melty and amazing. With this bowl, I decided to add in a spoonful of my Healthy Nutella, and I probably don’t need to tell you how that went, right? Banana + Nutella = Pretty much the perfect breakfast. What are some of your favorite easy and healthy breakfast recipes to make? Please feel free to leave links to your favorite breakfast recipes in the comments, to give breakfast inspiration to other readers. And if you need more oatmeal inspiration, here’s a link to more recipes: Healthy Oatmeal Recipes – 45 Ways To Eat Oatmeal. optional crushed walnuts, mini chocolate chips, shredded coconut, etc. Combine all ingredients in a small pot. Bring to a boil over medium heat. Once boiling, stir only occasionally to prevent sticking or boiling over. It will eventually thicken. Sweeten as desired. Add your favorite toppings. 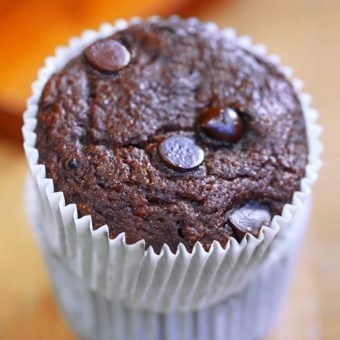 I like peanut butter, mini chocolate chips, or the healthy nutella recipe linked earlier in this post. Serve hot, or refrigerate overnight and serve either hot or cold the next day. Every time I click on the video, it just reloads the page. Could you please fix it? Yummy yummy! 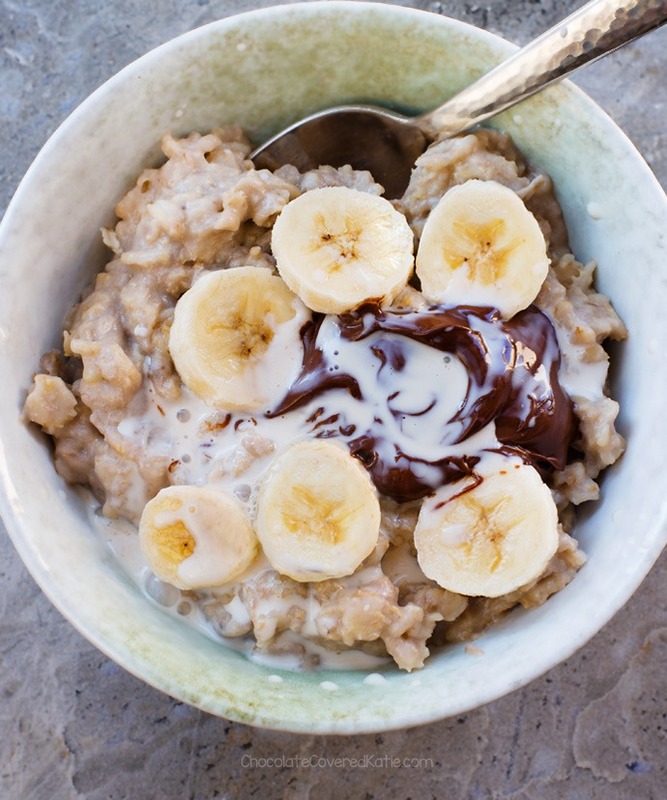 Bananas are the perfect pairing with oatmeal. This breakfast is so classic and so easy to make–it’s perfect for meal prep as well! 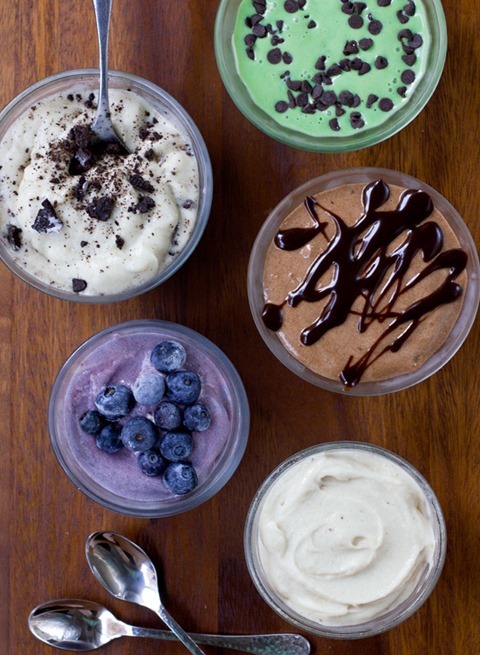 You can pretty much combine other toppings of all kinds with this base too! But you can’t go wrong with healthy Nutella and more bananas and almond milk, of course! I love your outlandish recipes (hello Unicorn Dip!) but the ones I actually try and the ones I keep going back to are the simple recipes like your three ingredient granola bars or the vegan peanut butter cookies. I’m definitely trying this one! This is making my mouth water! Oatmeal has been my go to breakfast or really any time recipe for years and I still crave it. I love your version! 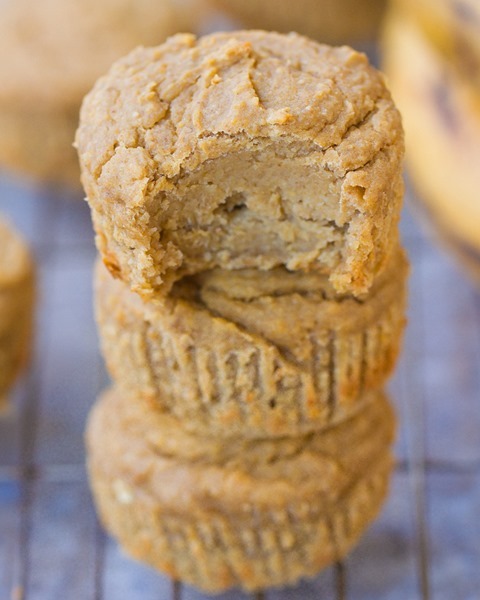 I’m not a huge banana fan, but love adding in pumpkin instead as well as PB2 for topping. Her recipes are always mouth watering. I’ve been eating my oatmeal like this for years now. The only difference is I make myself a half serving, but I use a whole small banana, a tablespoon of chia, and extra cinnamon. I always top it with additional fruit like blueberries. It’s my go to. In the warmer months I make refrigerator oats. My family laughs at me because I eat oats nearly every day and actually prefer them over other things, including pancakes, lol! Banana oatmeal is my go-to for breakfast in the cold months. I usually prep it all in a microwave safe bowl at night and take it to work and toss it in the microwave. 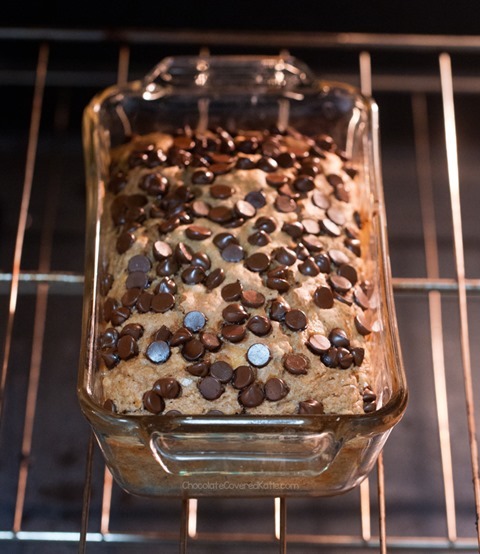 I think I need to start adding chocolate chips to it though because that sounds delicious! I am deceived this week to see an oatmeal recipe. I don’t need a recipe to make oatmeal and I doubt that a lot of other people do. I am looking forward to new recipes from you, hopefully one of a cheesecake without store-bought vegan cream cheese or yogurt, and made from scratch. I am wishing you a nice weekend, Katie. Please take your entitledness somewhere else. This is a free blog with recipes you have paid nothing for. Unless you are paying something for the recipes Katie puts out on her blog then your comments are uncalled for, and not appreciated by other readers. This is Katie’s blog and therefore she can post what she wants. And there are also other readers here besides you, many of us appreciate the simpler recipes because they are the ones we’ll really make instead of just oogling over the photos. I love it Katie! I love inspiration for healthy recipes rather simple or more involved! I’ll be making this tomorrow!! The banana oatmeal looks great Katie. I’m wondering, if I want to make it in the microwave have you tried that? If you have, do you have a preference one over the other? I normally cook my oatmeal in the microwave so I was just curious. You can definitely do it in the microwave! I for one could never get tired of the oatmeal recipes. I was so excited to see this post because I feel like you used to do a lot of oatmeal recipes but hadn’t really done any in awhile. I eat oatmeal every day and would love to see more flavors on the blog! This was one of the best bowls of oatmeal I ever had. It was so creamy! I topped the oatmeal with walnuts and shredded coconut, which was delicious, but I also want to experiment with other toppings. Thanks for the great recipe! 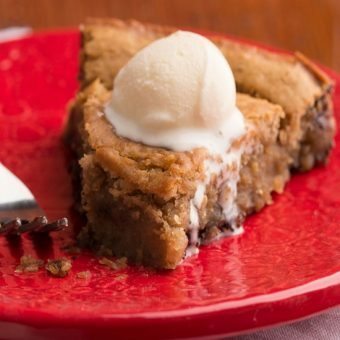 Love this recipe and very filling. I just made this and it was delicious. Thank you for the recipe. 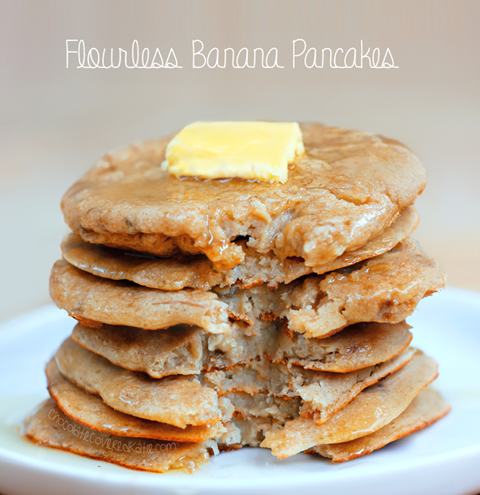 I love the use of bananas and oat meal in the dish,without the use of cinamon.great dish for breakfast. I love Blue Diamnd Almond Milk! I use it often for morning oatmel! I have also used it to add to cream soup. I would love to win a years supply please and thank you!! I love Blue Diamond Almond Milk!! I use it often for morning oatmeal. I also add it to cream soups. I would love to win a years supply please and thank you! I would lie to make ur oatmeal but I do not like bananas, can I add something else to the oatmeal? Just made this for breakfast. It was delicious! Didn’t need sweetener. The banana made it sweet enough for me.